Conclusion: 99 vitamin D-deficient adult patients seeking treatment for their severe muscle weakness and/or pains (myopathy) were put on a six-month high-dose vitamin D3 therapy regimen of 60,000 IU weekly for two months followed by 60,000 IU monthly for four months. 85% of the patients who finished the treatment experienced significant improvement in their muscle strength (measured by their ability to stand up from a squatting position). The study also found that the patients with lowest vitamin D levels also had the worst myopathy compared to those with higher vitamin D levels. Conclusion: Twelve severely vitamin D-deficient patients complaining of fatigue and myopathy were put on an experimental vitamin D3 therapy regimen, taking 20,000 IU every other day for 3 months. All patients reported an improvement in their symptoms. Despite taking what most doctors consider a very high dose of vitamin D for three months, the average vitamin D level of the group failed to rise into the optimal range. Conclusion: A 12-year-old girl was accidentally prescribed 100,000 IU of vitamin D3 daily (more than 10x what even most vitamin D enthusiasts believe to be safe) for a period of three months. She consumed at least 150 50,000 IU D3 capsules, totaling up to 7.5 million IU for the period. Her vitamin D blood level after this was found to be an extremely high 268 ng/ml. Amazingly, after a thorough evaluation, no symptoms of vitamin D toxicity were observed in her. Conclusion: 49 patients were given large doses of vitamin D ranging from 10,000 IU – 40,000 IU daily for a year, achieved an average peak vitamin D level of 165 ng/ml (beyond what is currently considered safe), and experienced no significant negative side effects. Conclusion: 46 healthy men and women were given 140,000 IU of vitamin D once a month for two months. Besides the average vitamin D level increasing from 24 ng/ml to an optimal 58 ng/ml at the end of the trial, the participants also experience a significant increase in their immune system’s regulatory T cells, demonstrating that vitamin D plays a critical role in proper functioning of the human immune system and helps protect against autoimmune disorders. Conclusion: Two individual case studies. The first is a man who took 4,000 IU of vitamin D daily for three years and then took 8,000 IU daily for three years. During his intake of 8,000 IU daily his vitamin D levels remained in the safe range and he experienced no negative side effects during this time. The second case study is of a man with multiple sclerosis who increased his daily intake of vitamin D from 8,000 IU daily to 88,000 IU daily. While ingesting 88,000 IU per day he did experience some hypercalcemia and his vitamin D levels reached an incredibly high 450 ng/ml. For two months he then abstained from vitamin D supplementation and the side effects dissipated. Note: This article covers a number of experiments where daily doses of vitamin D ranging from 10,000 IU to 50,000 IU were found to be safe. Note: Article explaining why we need vitamin D doses higher than currently recommended by the medical establishment. Conclusion: For 28 weeks, 12 multiple sclerosis patients were given weekly doses of vitamin D ranging from 28,000 IU to 280,000 IU. Although their vitamin D blood levels went far beyond what is currently considered safe, they experienced no negative side effects, and multiple sclerosis brain lesion activity decreased. Conclusion: This is a case study of a 2-year-old boy who’s mother accidentally gave him 2,400,000 of vitamin D2 over the course of four days (600,000 per day), which is 300x what is considered a safe daily dose for toddlers. The boy’s vitamin D level rose to an extremely high 470 ng/ml. Although he had to be hospitalized for two weeks for hypercalcemia, he made a full recovery. Conclusion: Five men and forty-five women with vitamin D deficiency were each given a single 600,000 IU injection of vitamin D3. This single mega-dose was effective at raising and keeping their levels above the clinical deficiency range four months and even twelve months later with no side effects. Conclusion: Old people need more vitamin D.
Conclusion: 67 men living at a high northern latitude were given a daily dose of either a placebo, 1000 IU vitamin D3, 5000 IU vitamin D3, or 10,000 IU vitamin D3 to take daily throughout winter. By the end of the study, five months later, only the men taking 5,000 IU and 10,000 IU had achieved vitamin D levels in the adequate range, with the 10,000 IU group having the most optimal levels. Those taking 1,000 IU daily achieved vitamin D levels only just slightly higher than the placebo group. All groups had an almost identical starting vitamin D level. These researchers concluded that taking 10,000 IU daily was completely safe for these men and none of them developed elevated calcium levels and the highest vitamin D level achieved by any of the men was still within what is considered the safe,healthy range. Conclusion: This is an incredibly strange story where a son and his father were repeatedly suffering symptoms from extreme vitamin D toxicity because the table sugar they were consuming with their food contained gigantic amounts of vitamin D due to a manufacturing error. The son’s vitamin D level at one point reached 1,480 ng/ml, nearly 15x what is considered the safe maximum limit. It is estimated that they had been unknowingly consuming 1,700,000 IU of vitamin D3 per day for seven months. Despite suffering extreme toxicity symptoms, including kidney failure, requiring multiple hospitalizations, they made a full recovery and maintained sufficient vitamin D levels for a long time. Conclusion: Men and women were given daily doses of vitamin D ranging from 1,000 IU to 4,000 IU for 2-5 months. None of them experienced negative side effects. Conclusion: Adult men and women were given either 1,000 IU or 4,000 IU of vitamin D3 to take daily for 2-5 months. Not only did 4,000 IU not cause any negative side effects or toxicity, it was also not enough to raise the mean vitamin D level beyond 40 ng/ml (most leading experts recommend 50 ng/ml), suggesting that the average adult needs more than 4,000 IU per day. Conclusion: Contrary to the long-held belief of the medical establishment that adults should take no more than 400 IU of vitamin D daily, this study concludes that adults need at least 4,000 IU of vitamin D daily to achieve sufficient vitamin D levels and that even 10,000 IU of vitamin D daily is safe for adults. It takes long-term dosing of vitamin D in excess of 40,000 IU daily to develop vitamin D toxicity and hypercalcemia in adults. Lifeguards and outdoor workers often obtain very high natural vitamin D levels from their heavy sun exposure that would take long-term daily supplement doses in excess of 10,000 IU to achieve. Conclusion: 60 healthy babies were given a single vitamin D3 dose of either 100,000 IU, 200,000 IU, or 600,000 IU. 2 weeks later their vitamin D levels were tested. The babies given 100,000 IU actually had a slightly subpar mean vitamin D level. The babies given 200,000 had an optimal mean vitamin D level. The babies given 600,000 had a toxicly high vitamin D level with 50% of them continuing to have vitamin D overload for up to 6 months. The babies given 600,000 IU experienced symptoms of hypercalcemia, whereas the babies given 100,000-200,000 IU did not. A 100,000-200,000 IU megadose of vitamin D3 every three months was found to be safe for infants with the researchers concluding that 100,000 IU presents the lowest risk of any side effects. Conclusion: In this study babies were given a vitamin D2 megadose of 600,000 IU every 3-5 months and then evaluated two weeks later after the dose. Their vitamin D levels rose above the “normal” level (whatever that standard was in 1987), but returned back to normal between the doses. 34% of the babies experienced hypercalcemia, which means infants should not be given such large doses. 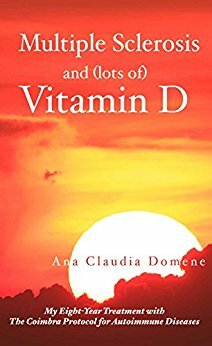 Amazingly though, 66% of the babies tolerated these giant megadoses without any hypercalcemia, revealing just how well humans, even babies, do tolerate vitamin D.
Multiple Sclerosis and (lots of) Vitamin D (2016) by Ana Claudia Domene details her experience over the last decade of successfully treating her aggressive multiple sclerosis with high-dose vitamin D therapy under the supervision of Dr. Cicero Coimbra and completely putting the MS into remission. The book also contains nine other case studies from some of Dr. Coimbra’s other multiple sclerosis patients who have been able to put their MS into remission with high-dose vitamin D therapy and even reverse their neurological damage from MS in two cases. 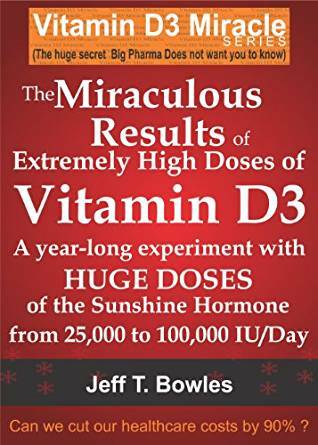 The Miraculous Results of Extremely High Dose of the Sunshine Hormone Vitamin D3 (2013) by Jeff T Bowles details his one year experiment of taking very large daily doses of vitamin D ranging from 25,000 IU to 100,000 IU daily with no negative side effects. The book also includes 26 testimonials, mostly from the book’s Amazon reviews, from other people who have had success with high-dose vitamin D therapy for treating chronic pain, depression, chron’s disease, lupus, psoriasis, atrial fibriliation, multiple sclerosis, plantar fasciitis, acne, asthma, obesity, sleep problems, joint pain, autism, cysts, and infertility.